The four shadowy figures ended up being Death, Famine, War and Pestilence – evil forces of nature who have allied themselves with Null and defeated our heroes. 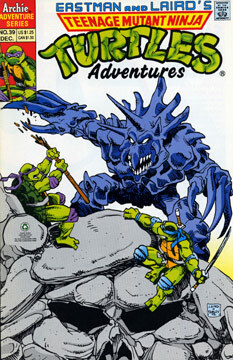 As this issue opens, Null has the TMNT and Mutanimals shackled to posts. Jagwar demands to know why Null has destroyed the rain forest and kidnapped his mother. The evil corporate devil explains that he did it to make the Earth inhospitable to all life. Splinter asks Null what he plans to do with his captives and the villain explains that they will all be slowly electrocuted to death on the posts. Ninjara snarls for him to get it over with, but Null delays and states that he will not be the one to push the button that begins the execution, he has someone else in mind for that task. The demon then he walks off to his hidden headquarters in the hills. When Null gets to his destination, he discovers that both Azrael and Juntarra have escaped. Azrael arrives at the spot where our heroes are tied and attacks the Four Horsemen of the Apocalypse. In his efforts to capture the eagle, War crashes through the posts holding some of our heroes, freeing them. A battle ensues while Don quickly frees the others. In the distance, the cowboy known as Kid Terra spies on the Reaper, who is controlling War, Famine and Pestilence by means of puppetry. Juntarra is with Kid – she runs off to help her son while Terra heads up the cliff where the Grim Reaper is preoccupied with the battle below. Kid Terra punches the bonehead, but Null arrives on the scene and shoots the cowboy, who falls from the top of the cliff to the ground below. The battle between the mutants and the Horsemen continues, while the Reaper seizes the Kid’s lifeless body. Juntarra, Ninjara and Azrael corner Null – who freaks out when faced by three powerful women. While the Reaper is preoccupied with the Kid’s body, Screwloose finds the puppets that the deathly villain was using to control the other Horsemen. Screwloose grabs the puppets and smashes them on a rock – causing the real monsters to disappear into thin air! Null pulls a gun and keeps his adversaries at bay, before sprouting bat wings and escaping. The Reaper laughs with satisfaction and holds a glowing orb high above his head, gloating that it has captured Kid Terra’s soul. Juntarra grabs the Reaper’s scythe and smashes the skeleton to bits – Azrael leaps and catches the Kid’s soul and places it on his head, where it seeps back into his body. Once he’s absorbed his soul, Kid Terra stirs back to life! The Reaper’s bones turn to dust and Kid asks someone to remove the bullet from his chest – Raph states that he can do it with the right implements. Jagwar is finally reunited with his mother. Off in the distance, the Grim Reaper’s dust reforms into its skeletal form and rides off on its horse. Later, Kid Terra peacefully recovers from his impromptu surgery as the Turtles wonder where Cudley the Cowlick could be.